As with any system, and especially with larger systems, easy access to the display tank and all its components is of utmost importance. 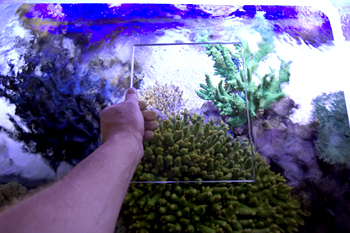 Without easy access, coral placement and general maintenance becomes impossible. My tank is 90 inches from front to back and, as a result, requires access that goes beyond conventional thinking. 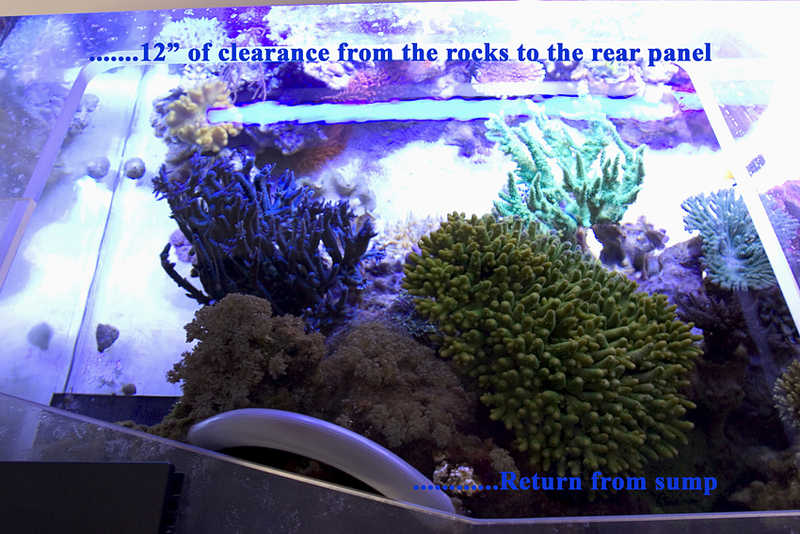 The only way to ensure access to every inch of the display tank without having to resort to the use of special tools is to be able to stand next to the tank and reach into the tank without having anything in the way such as a light hood. This situation would then allow the aquarist to easily bend over the tank and access every inch of the tank. This extreme access could only be achieved by solving two problems. 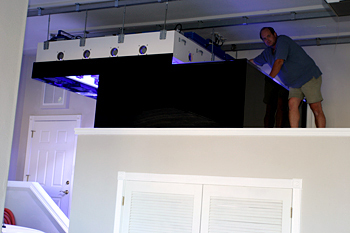 First, the light hood would have to be placed on a rail system to enable the light hood to be easily slid completely out of the way, and secondly, the stand would have to be over-sized to allow the aquarist to stand alongside the display on all three sides . These two solutions not only allow complete access to the display tank; but also, make access through the front viewing panel completely unnecessary. This means that the finish carpentry around the viewing panel doesn’t have to be burdened with trying to include access doors that hamper the goal of providing a clean “picture frame” look. Since my garage floor is four feet lower than the main level of the house, the display tank is located about 7 feet off of the garage floor. This configuration provides ample space to locate all the support equipment completely behind the closed doors of the stand “room”. All the components are placed within the stand with easy access and maintenance in mind. Another problem with not being able to access the tank from the front is the inability to see what you’re doing. I solved this problem by employing a 4” X 6” piece of acrylic to use as a viewing plate. 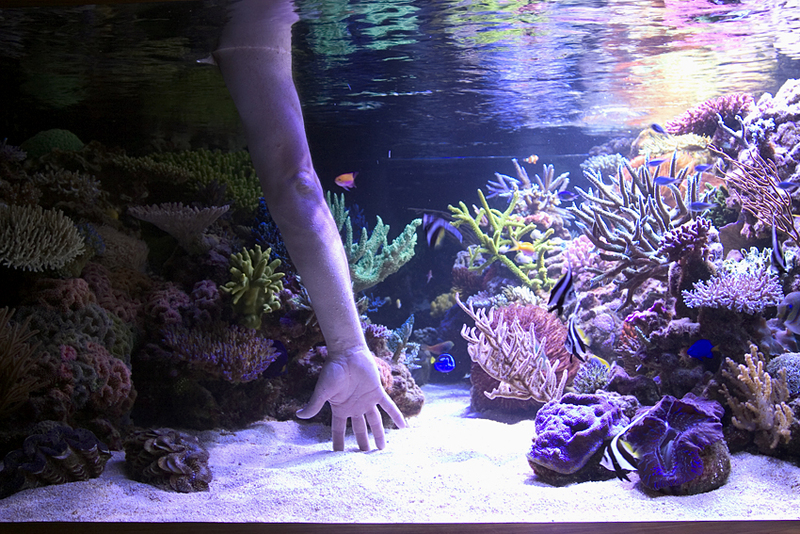 Since I don’t turn off my pumps for normal maintenance, the viewing plate is held in my left hand against the choppy water’s surface and aquauscaping or cleaning is accomplished with my right hand. It’s akin to using a snorkel mask. Redundancy is especially important when tanks and their associated investments start to get as large as this system is. 1) By using the Neptune controller, I can take advantage of the programmable safety features that come with this unit; namely, the controller is programmed to shut off all the lights if the temperature gets too high. 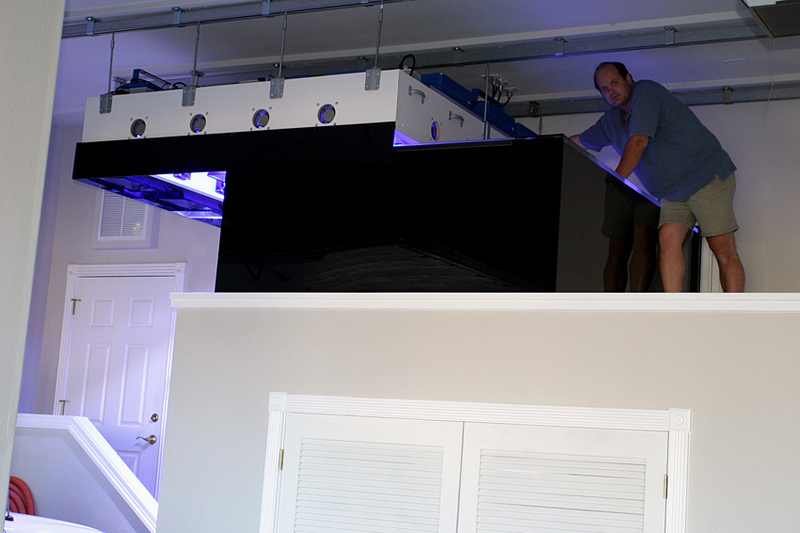 My tank, with its 5800 watts of light, could cook the tank in short order if there were a chiller failure. 2) I have two 1 3/4hp chillers running on this system; however, one of chillers can handle the cooling demands by itself. By running two chillers, each on its own separate dedicated circuit, the risk of a chiller failure is remote. 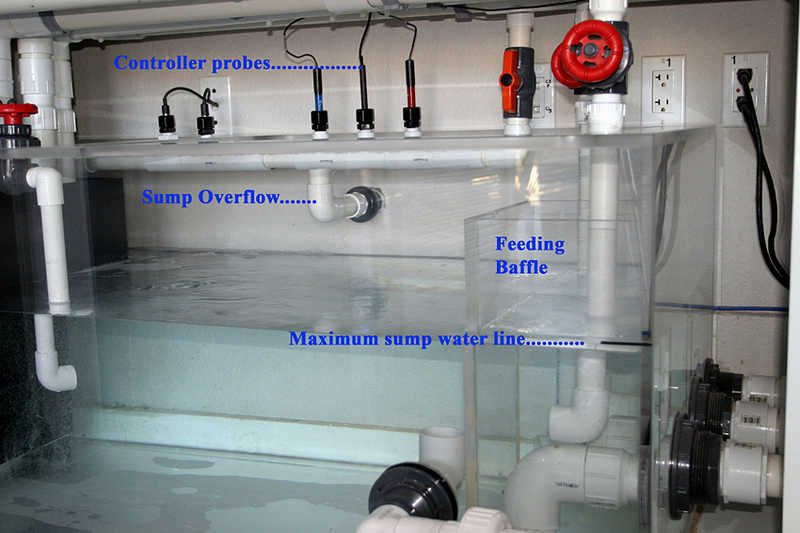 3) I also run two 4300 Sequence20 pumps from my sump to the display tank when really only one pump can handle the demands. By running two pumps, I’m lowering the risks of a sump pump failure .If one were to fail, the other pump can move enough water to meet the sump equipment’s demands. 4) I have an audible temperature alarm in the garage, as well as in the house, to alert me of any water temperature problem. 5) I keep three generators that are tested monthly, to counter any power failures. Power failures are rare at my house (haven’t had one in two years); but, the generators allow me to operate all systems with the exception of the lights until the power is restored. 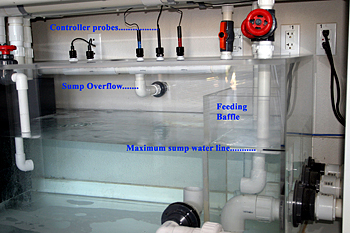 6) In the sump, I have a drain at the top of the sump. This drain ensures that there cannot be a sump overflow. 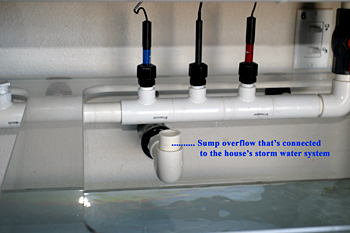 This drain is hooked up to the house’s storm drainage system and will direct any potentially overflowing water from flooding the garage floor and any equipment that may be in the water’s way. 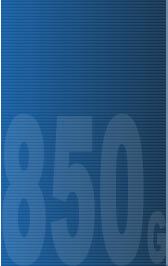 Site design and development by Uxable | Copyright © 2004 Steve Weast. All rights reserved.